Yesterday, Michelin opened a new plant in Piedmont, SC. 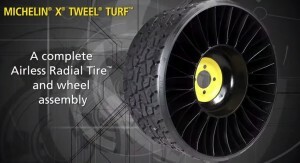 It’s the global company’s first plant dedicated to manufacturing the game-changing Tweel. Currently Tweels are available for certain construction equipment and John Deere lawnmowers, but the new plant in Piedmont will be dedicated exclusively to building these—so who knows where we’ll be seeing them in the future? Greenville and its neighbors have become a kind of hub for the automotive industry. Michelin’s North America headquarters is here in Greenville, and luxury car maker BMW’s only U.S. manufacturing plant is in Greer. We’re also seeing cool things coming out of Clemson University’s International Center for Automotive Research (CU-ICAR), which brings together top minds in the automotive industry. As in so many other ways, Greenville county is an exciting place to be!